At Snapclarity we strive to connect clients with appropriate mental health support in a timely manner. We understand, navigating the mental health system is difficult, even for health providers. Therefore any way we can make this process easier for clients, is a win for mental health. Our approach involves a high quality upfront mental health assessment in order to streamline clients to a therapist who specializes in the client’s area of concern. What is the Snapclarity Mental Health Check-up? 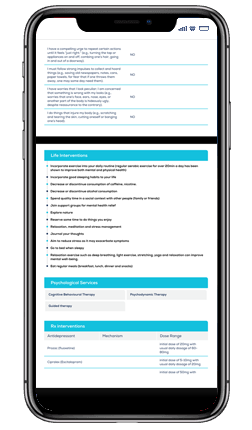 The Snapclarity Mental Health Check-up takes clients approximately 15-20 minutes to complete and determines clients’ risk level (high, moderate, low) for 13 commonly diagnosed disorders. The assessment is not a diagnostic tool, however, the assessment is based on 13 empirically validated short screeners that are publicly available and published in peer reviewed research. After completing the assessment, clients are provided with a PDF of their assessment results that they can view within the platform. 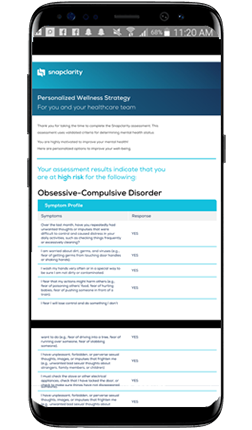 The assessment results are broken into those disorders they are high risk for, those they are moderate risk for, and those that they are low risk for. For each disorder, the assessment results also provides clients with their answers to the assessment questions. You will notice that some results for the moderate and low risk disorders do not provide as many answers, and this is because clients are skipped ahead to the next disorder question series if they do not flag as potentially high risk. How are assessment results useful to clients and care providers? Clients can share this information with you and other primary care providers, in order to increase provider awareness of the clients current symptomology. Providing assessment results and individual assessment answers provides an opportunity for clients, therapists and other care providers to observe changes in client responses and related symptomology over time. 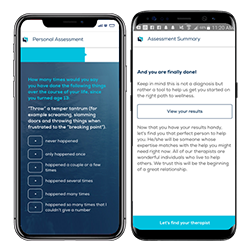 Snapclarity makes use of assessment results to match clients with therapists who specialize in providing therapy to clients with those areas of concern. In addition to the assessment results, clients are also provided with potential treatment pathways, including self-help tips, types of psychotherapies that are supported for these concerns, as well as first line pharmacological options. These suggestions are based on best practice and recent peer-reviewed research. It is important to know that there is a chance a minority of clients may be surprised, confused or alarmed by assessment results. Although Snapclarity provides information about the assessment and interpreting the results on the Snapclarity HelpCentre and website, we encourage therapists to take the time to walk through the assessment results with clients. It is important to communicate to clients that the assessment results are meant to be informative in nature, that they are helpful for therapist-client matching, and may help to shorten intake appointment times, but that the results are not a diagnosis. If clients are interested in a formal clinical assessment and potential diagnosis, they can be referred to a local clinical psychologist or psychiatrist. What is Snapclarity's Mental Health Checkup?